If your car's check engine light is on or you've noticed your car overheating, leaking oil, or generating white smoke smoke coming from the tailpipe, you need to get your engine checked. With an initial check of your engine, the experts at Budget Muffler Brake & Automotive can usually determine if the issue is something small, such as a loose gasket or bad oxygen sensor, or something larger, requiring further investigation. In either case, you can expect to receive honest recommendations, competitive rates, and excellent service. We pride ourselves on our ability to troubleshoot and diagnose engine problems for standard, automatic, and 4x4 transmission vehicles. Our ASE-certified technicians average 20 years of experience and have performed engine work on thousands of cars. They can be trusted to have the expertise to not only identify the underlying problem with your engine, but also provide cost-effective, long-lasting, and reliable solutions. 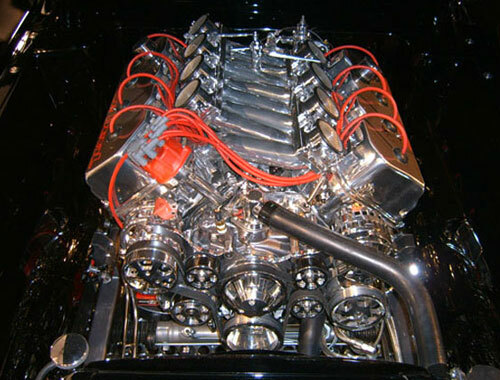 Our engine services include valve jobs, head jobs, rebuilt motors, complete replacement, and maintenance, such as oil/filter changes, tune-ups, 30/60/90K scheduled service, transmission fluid changes, and timing belt changes. Additionally, we offer transmission repair, rebuilds, and exchanges; differential services; cold air intake installation; JBA Header installation to improve the performance of your exhaust system and increase the horsepower of your engine; battery replacement; coolant flushes; water pump repair/replacement; thermostat replacement; radiator service and repair; and more. Come in today for a free engine light check. During an engine light check, one of our experts will read the codes on your car's computer and see what can be diagnosed from it. If it looks like the problem could be urgent or lead to more costly repairs, we'll provide you with our honest recommendations and upfront cost estimates. We're open 8am to 5pm, Monday through Friday, and 8am to 4pm on Saturdays. We can accommodate walk-ins as well as appointments. You satisfaction is our #1 priority, so we will never sell you anything that's unnecessary and won't take shortcuts. Budget Muffler Brake & Automotive is licensed and insured. We typically provide same-day service for small repairs, and can provide courtesy pick-up/drop-offs or loaner cars for major repairs, such as engine and transmission rebuilds.